Not just another cheap plastic sheet that is impossible to make look right! As a parent, you will truly appreciate the quality of this superhero landscape It's not huge, but big enough for kids and makes any party super fun. You don't have to be a DIY wizard to set this up. The props are printed, cut out and come with flat sticks, double-sided sticky pads and tape to wall hang the backdrop. Just go ahead and set up wherever you need it, although you might like to iron the fabric first to get any folding creases out. Not only can you use this for any celebration, because it's cloth, you can use it as a tablecloth, photo studio backdrop put it in a playhouse or hang it up on your son or daughter's wall so they can enjoy it year round. 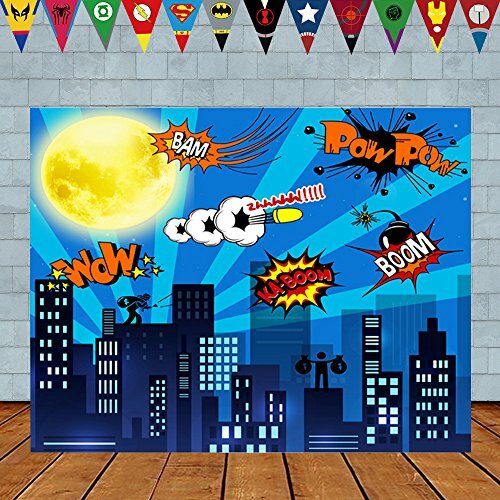 Superhero cityscape photography backdrop 5 x 3feet, 2set Superhero Party Banner. Versatile: Can be used as tablecloth, wallpaper, curtain, backdrop for photo studio, play house, playroom and any club event. Easy to set up and use. Our superhero photo backdrop is printed using the latest state of the art technology and eco-friendly inks, on 100% satin fabric. If you have any questions about this product by asdfg, contact us by completing and submitting the form below. If you are looking for a specif part number, please include it with your message.